Making a Will is an important part of planning for your family’s future. Every adult who owns an asset(s) or has a spouse or children should have a will. Surprisingly, many people don’t have one. Spending a few hours with your Notary Public planning your estate could save your spouse, children and other beneficiaries much time, effort and money. When you don’t have a Will, you lose control over who gets how much of your estate and when. You also lose the right to appoint a guardian of your choice for any young children you have. Furthermore, if you die without a Will, your property will be divided according to B.C. law, and the costs to administer your estate will increase. DMV Notary Mobile can notarize your Last Will & Testament. A power of attorney is a legal document that appoints another person, called an “attorney,” to deal with your business and property and to make financial and legal decisions on your behalf. It does not include Health Care decisions. A power of attorney can be very specific or very broad. A power of attorney ends if you become mentally incapable unless it is enduring. that person can be a family member, friend, professional. With a representation agreement, you can choose someone you trust to be your legal representative, who may make medical & health care decisions for you if you are incapable of doing so on your own. A representative may be given decision-making authority for your personal care and health care, and, in some cases, the routine management of your financial affairs, including legal matters. That person can be family member(s) or friend(s) if they are willing. If you are in need of a mobile notary to come to you and help with your documents, call us at (202) 826-8179 or contact us here. 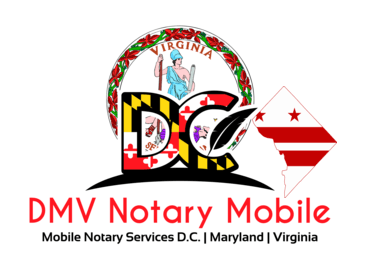 Mobile Notary in DC | Mobile Notary in Maryland | Need to Sell Your House Fast?